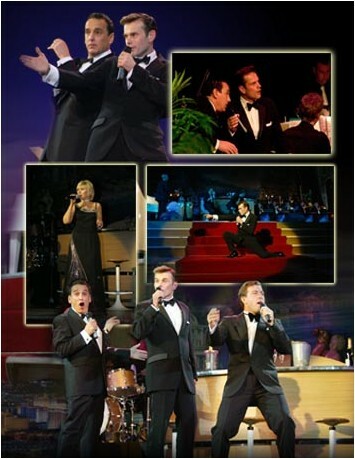 'The Kings of Swing' with the Nelson Riddle Tribute Orchestra and special guest Lynn Kennedy. With over 2 hours of 'swinging classics' this highly successful show played to over 250,000 people in its residency at the Blackpool Tower during 2004! 3 great swing singers, special guest Lynn Kennedy, and the world famous 'Nelson Riddle Tribute Orchestra' combine to take you on a truly magical journey back to an era when people fell in love to the music of Frank Sinatra, Bobby Darin, Tony Bennett, Doris Day and many more. Whether you are a fan of Sinatra or Tony Bennett, or of the newer singers such as Robbie Williams and Michael Buble, this celebration of the smooth and sophisticated will soon have your feet tapping and your fingers clicking.